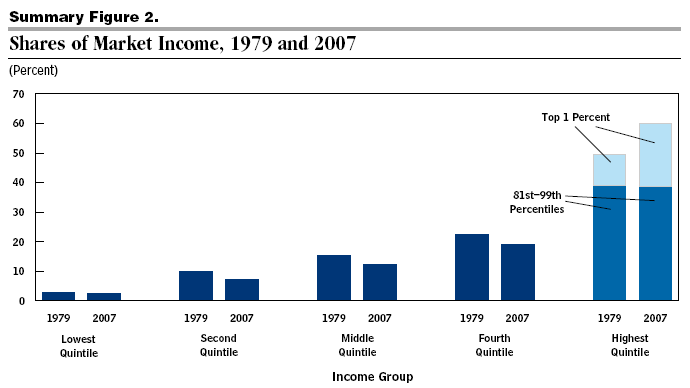 The report, ‘Trends in the Distribution of Household Income Between 1979 and 2007’, by the Congressional Budget Office (October 2011) on income inequality underscores the total disengagement between the Obama administration and the entire political system on the one hand and the interests and desires of the vast majority of Americans on the other. In the USA, the political and media establishment is presently occupying itself instead with a debate over how much further taxes for the corporations and the rich should be cut and how much more deeply social programs for workers and poor people should be slashed. The massive growth of social inequality over the past three decades has been the result of an unrelenting ruling class offensive against the working class. That assault has been carried out under Democratic as well as Republican administrations. The offensive against American labour and the working class was launched in earnest during the Ronald Reagan presidency, as early as 1981. That was the signal for more than a decade of wage-cutting, strike-breaking, union-busting and labor frame-ups, made possible by the complicity of the trade union bureaucracy. It deliberately isolated and betrayed scores of bitter struggles in order to break the militant resistance of the working class. The spread of social misery in the midst of soaring corporate profits and CEO pay is starkly shown in the growth of poverty in US suburbs. The New York Times recently reported that the ranks of the poor living in the suburbs of US cities rose by more than half between 2000 and 2010. Two thirds of these new suburban poor dropped below the official poverty line between 2007 and 2010. The Times article, reporting analyses of US Census data by the Brookings Institution, said the increase in poverty in the suburbs was 53 percent, compared with 26 percent in the cities. In fact, average real after-tax household income for the 1 percent of the population with the highest income grew by 275 percent between 1979 and 2007. Average real after-tax income for that group has been quite volatile: It spiked in 1986 and fell in 1987, reflecting an acceleration of capital gains realizations into 1986 in anticipation of the scheduled increase in tax rates the following year. Income growth for the top 1 percent of the population rebounded in 1988 but fell again with the onset of the 1990–1991 recession. By 1994, after-tax household income was 50 percent higher than it had been in 1979. 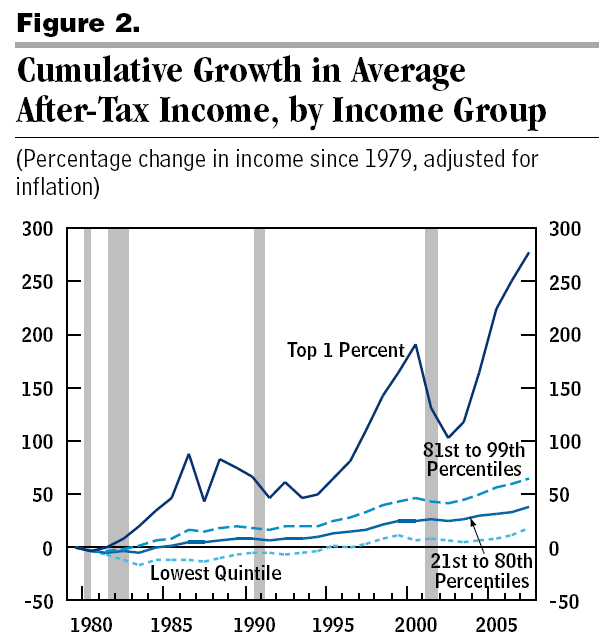 Income growth surged in 1995, averaging more than 11 percent per year through 2000. After falling sharply in 2001 because of the recession and stock market drop, average real after-tax income for the top 1 percent of the population rose by more than 85 percent between 2002 and 2007. Today, the United Nations Development Programme (UNDP) will release its 2011 Human Development Report, the 21st in the annual series that lets us know how well – or not – the populations in countries are doing. Whether on education, health, income, poverty, cost-of-living the human development indices are now well-constructed and evolved measures of the well-being of people. Today, we’ll know a little more about how 7 billion people live on our Earth. 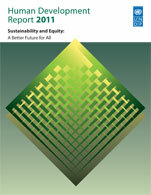 This year’s ediition is called ‘Sustainability and Equity: A Better Future for All’. The HDR website has said the report will call for the urgent global challenges of sustainability and equity to be addressed together – and that the 2011 HDR identifies policies on the national and global level that could spur mutually reinforcing progress towards these interlinked goals. These introductory articles are uniformly boring and uniformly useless to all those who deal with real questions, hard quetions and tough decisions every day. They say things like “bold action is needed if the recent human development progress for most of the world’s poor majority is to be sustained” and things like “the benefit of future generations as well as for those living today”. This is irritating, but has become part of the HDI furniture. For some perverse reason top politicians and top UN agency muckamucks seem unwilling to cut the waffling and get on with it. Anyway. we’re interested in the rest of the report, the data, the statistics, the methodologies, the background studies and a whole bunch of related research – so that’s what this and related HDI posts will dwell on in the weeks to come. The HDR website has mentioned that the 2011 report will talk about living standards. Here’s a sentence I want to read more about when the big package opens up: “Yet the 2011 Report projects a disturbing reversal of those trends if environmental deterioration and social inequalities continue to intensify, with the least developed countries diverging downwards from global patterns of progress by 2050.” What are the numbers that led to this prickly insight, I would very much like to see. Let’s look back. A year ago, in 2010 November, UNDP when releasing the HDR 2010 said that “most developing countries made dramatic yet often underestimated progress in health, education and basic living standards in recent decades, with many of the poorest countries posting the greatest gains”. 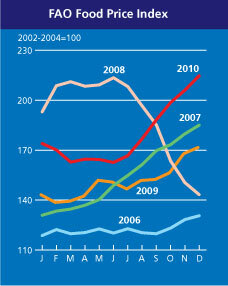 HDR 2010 cautioned that “patterns of achievement vary greatly, with some countries losing ground since 1970”. Overall, HDR 2010 showed that life expectancy climbed from 59 years in 1970 to 70 in 2010, school enrolment rose from just 55 percent of all primary and secondary school-age children to 70 percent, and per capita GDP doubled to more than US$10,000 (sorry, but this last is a particularly meaningless number). Life expectancy, for example, rose by 18 years in the Arab states between 1970 and 2010, compared to eight years in sub-Saharan Africa. 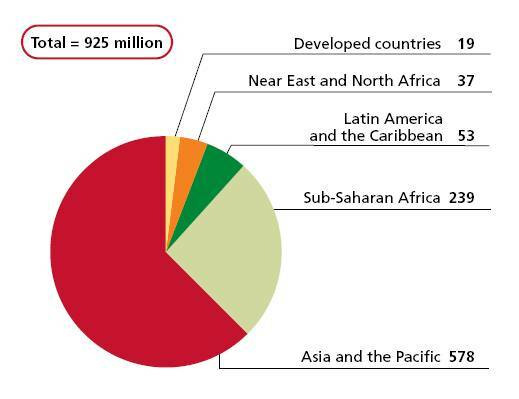 The 135 cuntries studied include 92 percent of the world’s population. Within the pattern of overall global progress, the variation among countries is striking, said HDR 2010. Over the past 40 years – that is, tilll 2010 – the lowest performing 25 percent experienced less than a 20 percent improvement in HDI performance, while the top-performing group averaged gains of 54 percent. Yet as a group, the quartile of countries at the bottom of the HDI scale in 1970 improved faster than those then at the top, with an average gain of 61 percent. Somewhat zanily, HDR 2010 then advised us that “the diverse national pathways to development documented … show that there is no single formula for sustainable progress”. Umm, we did somehow notice that, all by ourselves actually. • The Inequality-adjusted Human Development Index (IHDI) – For the first time, this year’s Report examines HDI data through the lens of inequality, adjusting HDI achievements to reflect disparities in income, health and education. The HDI alone, as a composite of national averages, hides disparities within countries, so these adjustments for inequality provide a fuller picture of people’s well-being. • The Gender Inequality Index (GII) – The 2010 Report introduces a new measure of gender inequities, including maternal mortality rates and women’s representation in parliaments. The Gender Inequality Index is designed to measure the negative human development impact of deep social and economic disparities between men and women. • The Multidimensional Poverty Index (MPI) – this is the equivalent of the 400-pound gorilla for all HDI-related stuff – it complements income-based poverty assessments by looking at multiple factors at the household level, from basic living standards to access to schooling, clean water and health care. About 1.7 billion people—fully a third of the population in the 104 countries included in the MPI—are estimated to live in multidimensional poverty, more than the estimated 1.3 billion who live on $1.25 a day or less. So, while waiting for the goodies from HDR 2011, there are some questions that still smoulder from earlier editions. Here’s one: what does the evidence from the past 40 years tell us about the relationship between growth and changes in human development? The two-panel chart which accompanies this post (below) presents the basic result. The left panel shows a positive association — though with substantial variation — suggesting that growth and improvements in human development are positively associated. Remember, however, that income is part of the HDI; thus, by construction, a third of the changes in the HDI come from economic growth, guaranteeing a positive association. That’s why a far more useful exercise is to compare income growth with changes in the non-income dimensions of human development (gift economies would be wonderful subjects). This has been done using an index similar to the HDI but calculated with only the health and education indicators of the HDI to compare its changes with economic growth. 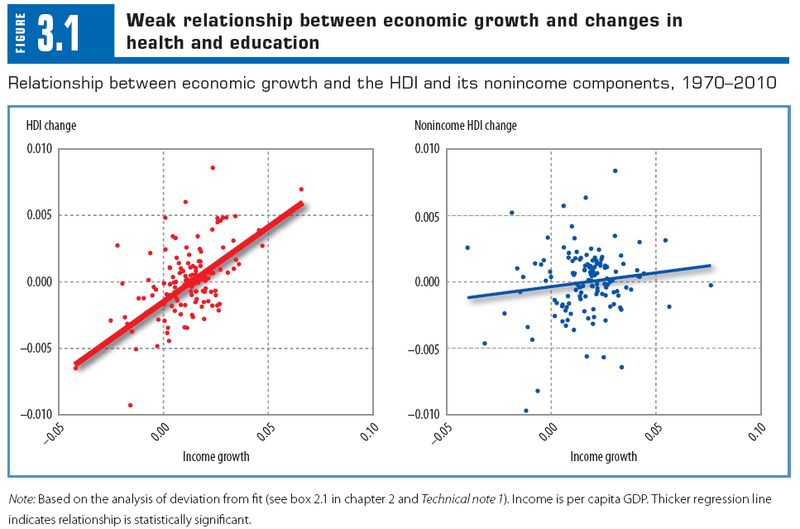 The non-income HDI is presented in the right panel of the chart – looking for the correlation? Remarkably weak and statistically insignificant, as they said so themselves. That will deliver a smart kick in the collected pants of the G20 muckamucks when they assemble (what? again!) in France (Cannes) for a new episode of creative bullshitting fiscal sophistry. But, here’s the strange thing. Previous studies have found the same result. One of the first scholars to study this link systematically was US demographer Samuel Preston, whose landmark 1975 article showed that the correlation between changes in income and changes in life expectancy over 30 years for 30 countries was not statistically significant. As ideas such as ‘sustainability’ and ‘environmental’ began gaining traction from the early 1970s onwards – think ‘Limits to Growth‘ – more data became available, and other researchers obtained the same result. In a 1999 article, ‘Life during Growth‘, William Easterly found a remarkably weak association between growth and quality of life indicators such as health, education, political freedom, conflict and inequality. Easterly’s work was ignored by the bankers and their compradors for years thereafter. Next, François Bourguignon, director of the Paris School of Economics, and several African and European colleagues concluded that “the correlation between GDP per capita growth and nonincome [Millennium Development Goals] is practically zero”. That should have been turned into a poster and hung on the wall of every bloody finance minstry from Abuja to Auckland. More recently, World Bank economist Charles Kenny recently confirmed the lack of correlation between improvements in life expectancy and growth, using both a large sample of countries over 25 years and a smaller sample covering a much longer period. I advise his still-serving colleagues to dust off his file and read his work, for the first time for them. Well, ’nuff said. Let’s wait till the HDR 2011 starts streaming towards us, tweets and video and all. 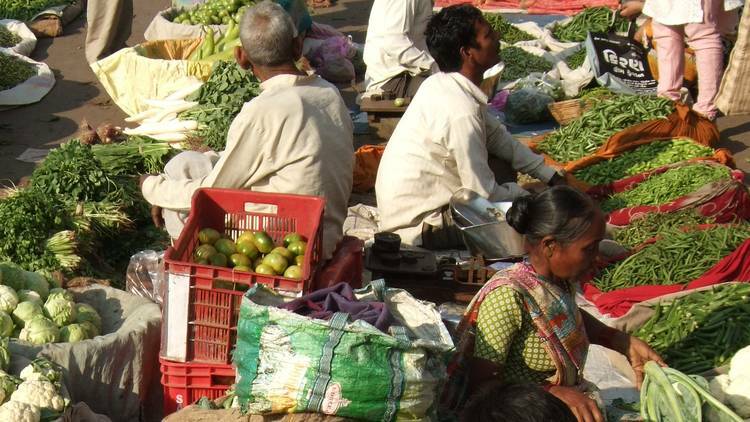 A bumper year for India’s food production? The third advance estimates of production of foodgrain in India has been released by the Ministry of Agriculture. 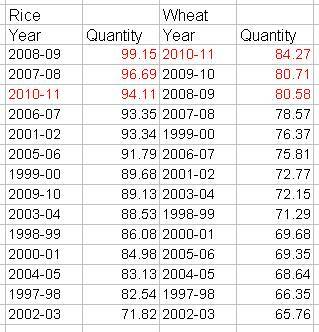 A comparison of final production of the years 1997-98 to 2010-11 (a 14-year period) with the third advance estimates shows that 2010-11 is expected to produce a record 235.88 million tons of foodgrain. This amount is higher than the 233.88 million tons of 2008-09 and the 230.78 million tons of 2007-08. The year 2010-11 is expected to yield the third highest production of rice in the 14-year period, with 94.11 million tons, the highest production of wheat with 84.27 million tons, and the second highest production of coarse cereals with 40.21 million tons. Total cereals are to be the second highest ever in the 14-year period with production estimated at 218.59 million tons. 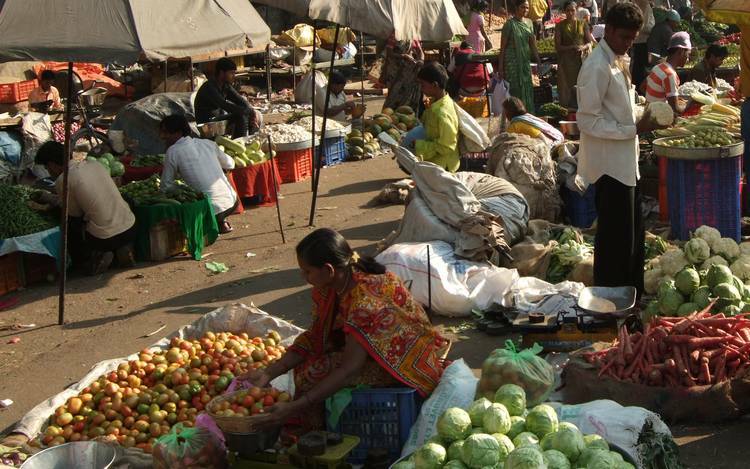 Total pulses are expected to be 17.29 million tons, the highest in the 14-year period. The third advance estimates will be seen by the Ministry of Agriculture and by India’s national agricultural research system (headed by the Indian Council of Agricultural Research; ICAR) as proof that the flagship programmes are delivering. These are the National Food Security Mission and the Rashtriya Krishi Vikas Yojana. The third advance estimates for 2010-11 was released on 2011 April 06 by the Department of Agriculture & Cooperation / Directorate of Economics & Statistics / Agricultural Statistics Division. Low precipitation resulting in diminished snow cover has reduced the protection of dormant wheat plants against frost kill temperatures (usually below -18°C) during winter months from December to February. Low precipitation and thin snow cover have also jeopardized the soil moisture availability for the post-dormant growing period. Thus, the ongoing drought is potentially a serious problem. 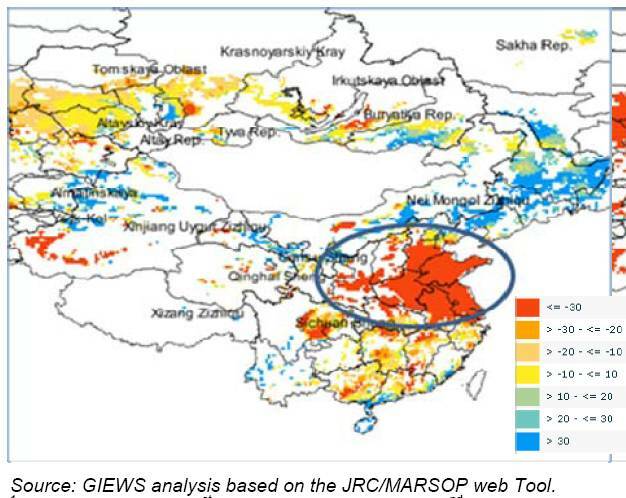 FAO China drought map showing cumulative rainfall and deficit in the wheat growing region. 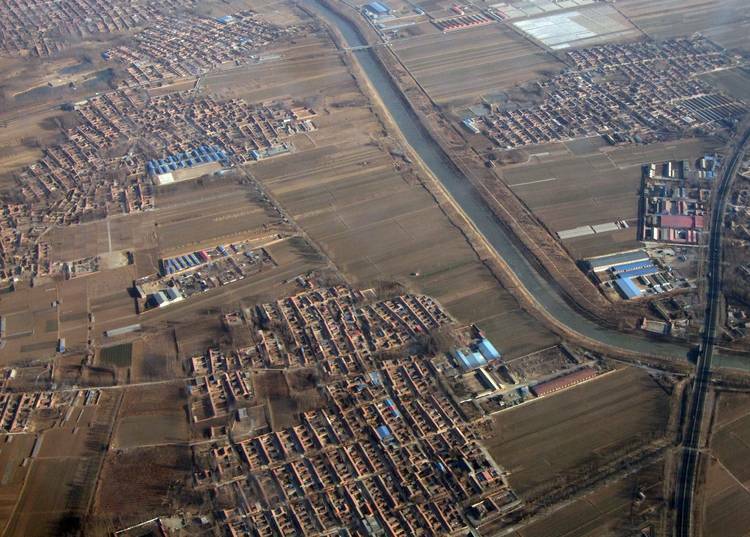 FAO’s GIEWS said that the main affected provinces include Shandong, Jiangsu, Henan, Hebei and Shanxi, which together represent about 60% of the area planted and two-thirds of the national wheat production. According to official estimates some 5.16 million hectares out of the total of about 14 million hectares under winter wheat may have been affected in these provinces. The drought has reportedly affected some 2.57 million people and 2.79 million livestock due to the shortages of drinking water. So far there have been some positive developments, such as the relatively mild temperatures, particularly the absence of frost kill temperatures, and the lower than average sub-zero temperature days. This combined with increased supplementary irrigation made available by the Government is likely to compensate to some extent the negative impact of low snow fall and low moisture availability. However, adverse weather, particularly extreme cold temperatures could still devastate yields. The Government has allocated some USD 15 billion to support farmers’ incomes and subsidize the costs of diesel, fertiliser and pesticide. This drought in north China seems to be putting further pressure on wheat prices, said FAO, which have been rising rapidly in the last few months. In January 2011 the national average retail price of wheat flour rose by more than 8% compared to two months earlier and stood at 16% higher than a year earlier. Although the current winter drought has, so far, not affected winter wheat productivity, the situation could become critical if a spring drought follows the winter one and/or the temperatures in February fall below normal. 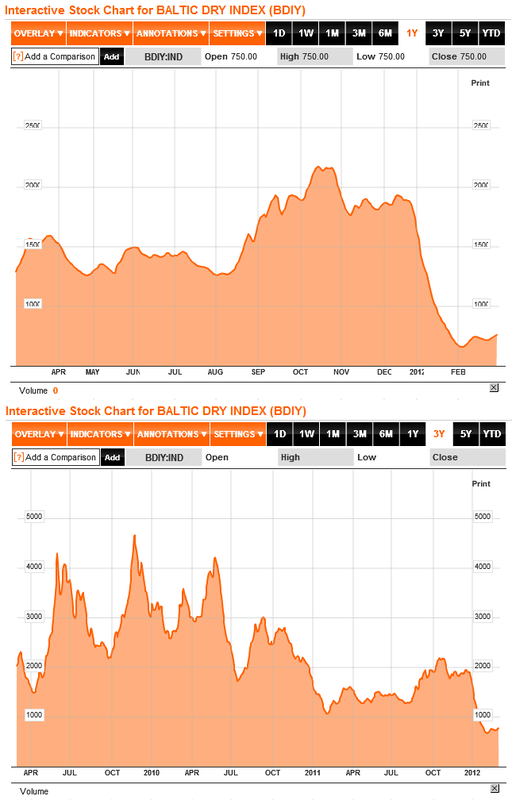 These charts describe the 12-month rise in two indices: FAO’s Food Price Index, whose all-time high is the cause for so much alarm, and the IMF’s commodity index for food, which is less often referred to for food price burden impacts, but is no less important. 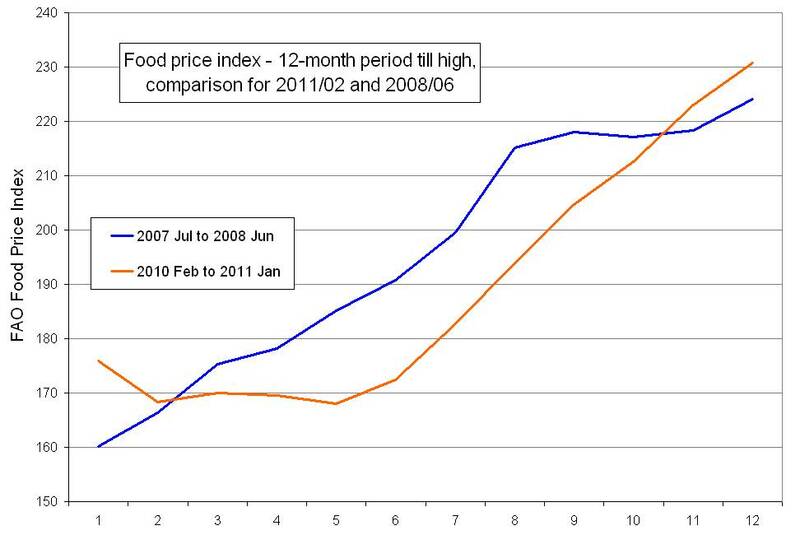 The FAO Food Price Index, comparative rise over 12 months for 2010 Feb to 2011 Jan and for 2007 Jul to 2008 Jun. 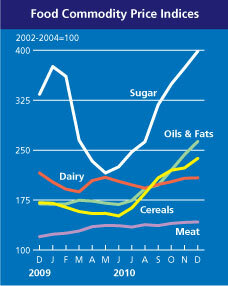 We see the index movements until the 2008 peak and the current peak of the FAO index and of the IMF food index (below). Over a year’s rise they are similar, but the worrying factor is the base for the 2010-11 rise, which is higher in both. 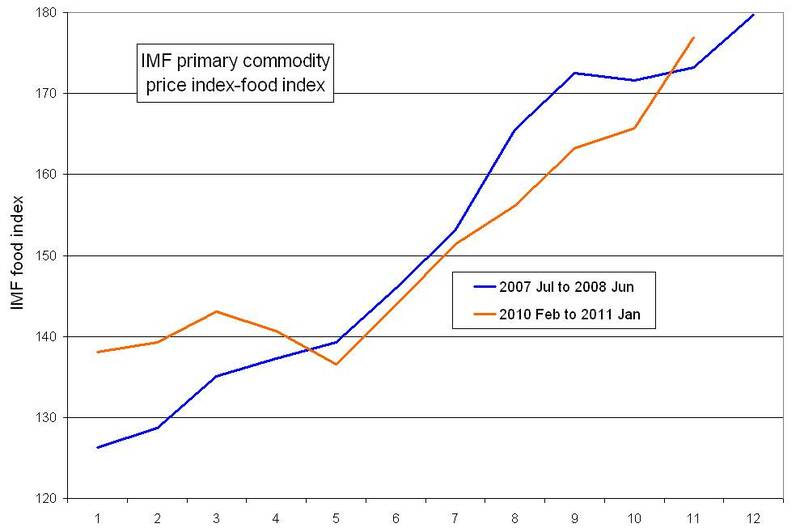 The IMF Commodity (Food) Price Index, comparative rise over 12 months for 2010 Feb to 2011 Jan and for 2007 Jul to 2008 Jun. The 2010 edition of the State of Food Insecurity says much too little and what it does say is unconvincing. There is a theme for this years edition of one of the Food and Agriculture Organization’s (FAO) ‘flagship’ reports. The theme is “countries in protracted crisis” by which FAO means conflict and war, internal and external. FAO doesn’t say so explicitly in the introduction to SOFI 2010 on its website. There’s no excuses for FAO not to when the World Food Programme, Oxfam, ActionAid and a number of international agencies and aid groups have done so, not just this year but for at least a decade. As the world’s pre-eminent compiler of food and agriculture-related research, data and analysis, FAO ought to see itself as duty-bound to be clear and fair in its reportage but it is not. SOFI 2010 says that the majority of the world’s undernourished people live in developing countries. Two-thirds live in just seven countries (Bangladesh, China, the Democratic Republic of the Congo, Ethiopia, India, Indonesia and Pakistan) and over 40% live in China and India alone. The report says that “FAO’s projections for 2010 indicate that the number of undernourished people will decline in all developing regions, although with a different pace. The region with most undernourished people continues to be Asia and the Pacific, but with a 12% decline from 658 million in 2009 to 578 million, this region also accounts for most of the global improvement expected in 2010″. Where does FAO think this improvement is going to come from, given the fact that its own food price index shows how cereals have risen at a clip this year to match the rise in 2007? Just as it did a month ago, the FAO is sounding like it is in two minds about what to report. SOFI 2010 says that “developing countries as a group have seen an overall setback in terms of the World Food Summit goal (from 827 million in 1990–92 to 906 million in 2010), while some progress has been made towards MDG 1 (with the prevalence of hunger declining from 20% undernourished in 1990–92 to 16% in 2010)”. Which are the 22 countries covered by the ‘protracted crisis’ theme? Here they are, the numbers in total population in millions followed by number of undernourished in millions, both for 2005-07. (Why couldn’t these have been for 2009 in a report dated 2010? ): Afghanistan (na / na), Angola (17.1 / 7.1), Burundi (7.6 / 4.7), Central African Republic (4.2 / 1.7), Chad (10.3 / 3.8), Congo (3.5 / 0.5), Côte d’Ivoire (19.7 / 2.8), Democratic People’s Republic of Korea (23.6 / 7.8), Democratic Republic of the Congo (60.8 / 41.9), Eritrea (4.6 / 3.0), Ethiopia (76.6 / 31.6), Guinea (9.4 / 1.6), Haiti (9.6 / 5.5), Iraq (na / na), Kenya (36.8 / 11.2), Liberia (3.5 / 1.2), Sierra Leone (5.3 / 1.8), Somalia (na / na), Sudan (39.6 / 8.8), Tajikistan (6.6 / 2.0), Uganda (29.7 / 6.1), Zimbabwe (12.5 / 3.7). The question, what happens when China and India are excluded from calculations? With the exclusions 130.4 million (China) and 237.7 million (India) fall out of the equations? Moreover, SOFI isn’t following it’s own data. 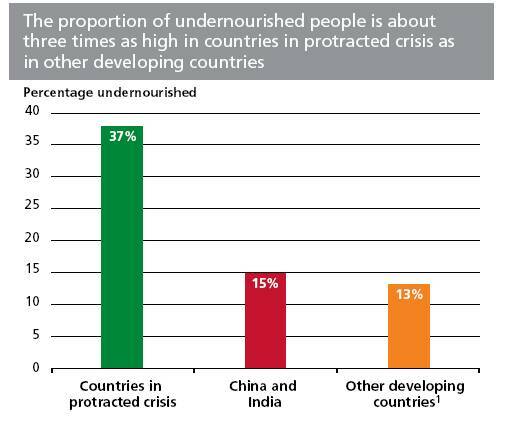 The para above says 166 million (approx) undernourished in countries in ‘protracted crisis’ but the table annex shows that the 22 countries together have 146.8 million undernourished. If the larger number for the 22 countries is the 2009 estimate, then FAO could have used the same method to provide estimates for all countries for 2009. When FAO recalculates its food price index monthly (the current index is up-to-date for September 2010) why are these estimates three years old? Why should China and India be excluded when they account for over a third of the global undernourished population? Last month FAO said that 925 million people in the world live in chronic hunger and explained that “the decline (from 1,020 million in 2009) was primarily attributable to better economic prospects in 2010 and the fall in food prices since mid-2008”. 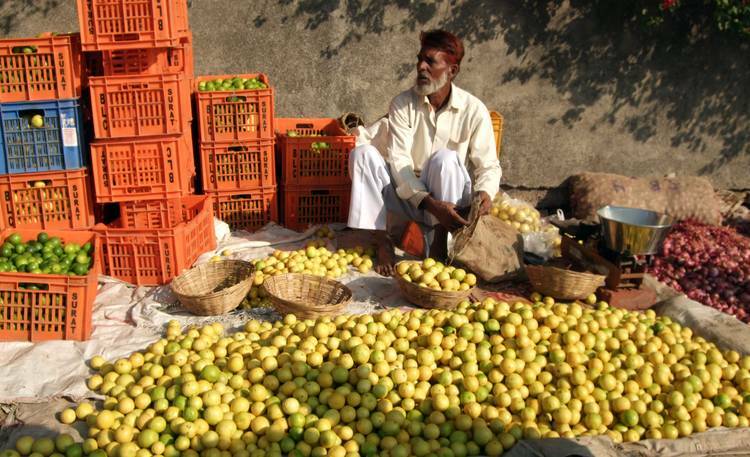 What fall in food prices? What better economic prospects? 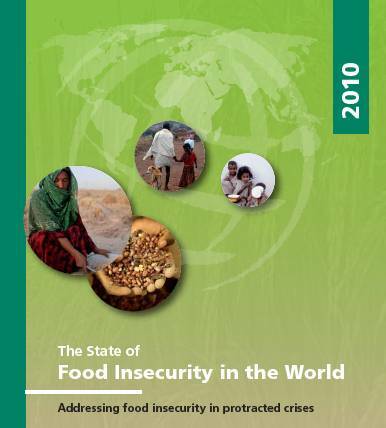 The State of Food Insecurity 2010 is a disappointing and pedestrian effort. FAO ought to retract this version and revise it thoroughly without dwelling on themes like ‘protracted crisis’ and instead get to grips with the market- and economics-related reasons for food price spikes and the hunger they bring.